My new category, Vegetable Dinners, will be a collection of meals based on vegetables. Some are vegetarian and some aren’t, but where meat is used, it’s a small amount and is used more as a seasoning than as the bulk of the meal. Where relevant, notes on how to make them vegetarian or vegan are included, but many of them taste best with a little meat or fish included, and my recipes note this. My kitchen mantra is “Eat less meat, eat better meat,” and the same goes for eggs and dairy products. Since you aren’t using much, you can afford the best and most sustainable. Summer vegetables are at their peak now, and in my home most of our meals are based on them. 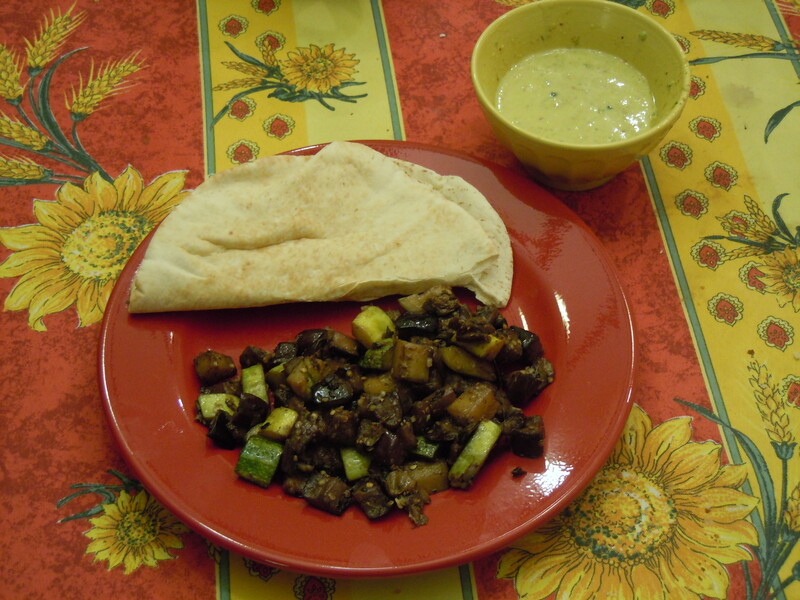 Mixtures that can be wrapped in a pita make a light easy meal on hot days. The filling can be made ahead, and keeps a few days in the refrigerator. OIl-cured black olives are used to add a meaty savor to eggplant and zucchini, and capers add an herbal note. This meal is vegetarian, and can be made vegan if you alter the sauce recipe a little. Cut the eggplant in cubes 1/2 inch or a little larger on a side. Whether you peel it first is up to you. The finished dish has a more tender texture if the eggplant is peeled, but less fiber and fewer antioxidants, so take your pick. Personally, I leave the peel on for this dish as long as the eggplants are young and tender. Cut the zucchini in quarters and slice each quarter into segments on the small side of 1/2 inch. Toss the vegetable cubes together in a bowl with 2 teaspoons of salt and let sit at least 1 hour, tossing occasionally. This step is important for this dish and shouldn’t be shortened. Don’t worry about the quantity of salt; if you do the squeezing step well, most of it will be removed with the liquid. You can soak the capers at the same time. Pit the olives and chop them coarsely, and chop the garlic finely. At the end of an hour, drain off exuded liquid and squeeze the veggie chunks in a clean kitchen towel, a few handfuls at a time, until as much liquid as possible has been squeezed out. Squeeze the capers dry and chop them coarsely. In a clay cazuela or 10″ skillet, heat a few tablespoons of the olive oil and add the garlic. Cook until opaque and cooked but do not allow it to start to brown even a little. Now add the olives, capers, and veggie chunks, toss to coat with the oil, and cook over low heat for about an hour, tossing occasionally and making sure it doesn’t burn on the bottom. Add a little water if needed to prevent burning. Texture is very important. Start tasting a little after 45 minutes or even 30 if it looks like it’s cooking quickly. When the zucchini is just tender but not mushy, and the eggplant is melting in texture, it’s done. Also check for salt, but the seasonings are salty and you are unlikely to need any. Stir in the parsley just before serving. Serve with good pita bread, lightly warmed, and the sauce below. This sauce is like an aioli but looser and less rich. The egg yolk just binds it and thickens it a little. If you leave out the egg yolk the whole dish is vegan, and the flavor doesn’t suffer at all but the texture will be liquid, not thick, and it will need to be stirred up by each diner before taking any. olive oil as needed, usually about 1/4 cup. In a small food processor, chop the garlic clove and the chile pepper. I always mince fresh chiles before putting them in the processor to make sure that big chunks don’t startle diners. Add the egg yolk and lemon juice, process briefly, and slowly drip in the olive oil until it’s as thick as you want. I like it to be liquid and spoonable, but velvety. Taste and salt as needed. Add the thyme leaves and stir in. For the vegan version, proceed the same way except leave out the egg yolk, and be aware that it won’t thicken in the same way but will be more like a vinaigrette. Don’t save leftover sauce more than a day in the refrigerator, because of the egg yolk, but I like to spread leftover sauce on a warmed pita for lunch the next day.